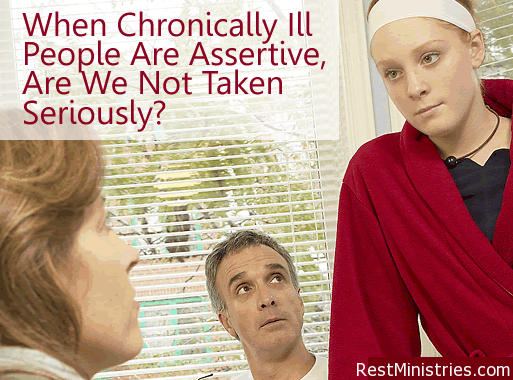 When Chronically Ill People Are Assertive, Are We Not Taken Seriously? Sometimes you need to share how you are feeling to avoid miscommunication. Other times you must be assertive about how early you can get to a doctor’s appointment. When you are assertive do others ignore it, believing your illness is making you irrational or irritable? I had just received the third pink slip in two weeks from the lab that said my payment was passed due. Over three times I had called and my insurance company had assured me that the lab work was covered and that they would mail out a check that afternoon. This time, when I finally got a representative on the telephone, I was polite, but firm. I said that I wanted the problem taken care of immediately, and I wrote down her name and the supervisor’s name. It was time to get even more assertive. When chronically ill people are assertive, is it not taken seriously? Is it assumed that we won’t have the energy or stamina to fight all of the battles that we will face? When we do talk to someone in customer service, we are rarely taken absolutely seriously. After all, isn’t it just the drugs that make us impatient and nit-picky about all of this insurance stuff? What is exactly is assertiveness? Most of us have had moments when we have slid into an aggressive mode, but assertiveness is based on one’s ability to confidently step forward. Rather than becoming aggressive, I believe that the chronically ill often become burnt out on fighting and we simply avoid any conflict. Who has the energy to fight for our rights? Next time a situation arises where you may need to be a bit assertive, here are some things in which to remember. For those of us with chronic illness, this is a big one! We must say, “no, thanks,” or “I’ll pass,” much more often than we would prefer. Even when we master the ability to say no, the guilt continues to sit with us for days. Let it go! You know your abilities and limitations and what is best for your own health and your family’s well being. Have you ever been on a jury and you had to state your decision upfront, but than as the deliberations continued, you changed your mind about the verdict? You have the right to say what you think, but it’s best to think before you speak. Is what you say going to hurt someone’s feelings? Are your comments going to help the situation? Just because you have a chronic condition doesn’t mean you have to eat at the same restaurant the rest of your life. Try new things! You may find a new hobby or a new activity that you are able to easily do, in which you would have never thought about. I replied, “You have sixty seconds to tell me why I should talk with you further about your product.” I listened… and no, he didn’t convince me. He felt okay about it though, and I got out of an uncomfortable thirty-minute sales pitch. You may be shy, but that should not mean you end up getting walked all over. Practice in front of the mirror if you must. As you step out and share your opinion, it may feel awkward at first, but then you will gain more confidence and it will become simpler the next time the opportunity arises. Even studies have shown that assertive people are more likely to have personal and professional relationships that are based on honesty and mutual respect. She is currently writing a book for Christian moms who live with chronic illness. If you are interested in sharing your stories, feedback and confessions for the book, visit her Facebook page at http://MomWithIllness.com . One Response to When Chronically Ill People Are Assertive, Are We Not Taken Seriously? During all of these times I felt I was not taken seriously. I felt I needed an advocate to prosecute my case. I felt like they assumed I did not have the energy or inner strength to “face” or “fight.” And in the end it was easy for them to blame medicare, my health insurance, the health care system, my frustration or my lack of financial resources. I felt brushed off and devalued instead of the positive, affirming, confident citizen, husband, father, career professional that I am! It would be easy to raise the “burned out of fighting” flag and surrender. But who is there to defend us when we say “no.” To help others think right or act compassionately. Who is walking beside us to advocate for us or keep us from being walked over to hold businesses, individuals, and institutions accountable? Thanks for your support.